Glad to see you, welcome back if you have been on my blog before and if this is the first time that you've stopped by.... I'm hoping that you will enjoy my blog. This is my inspiration card that I put together for this weeks post. 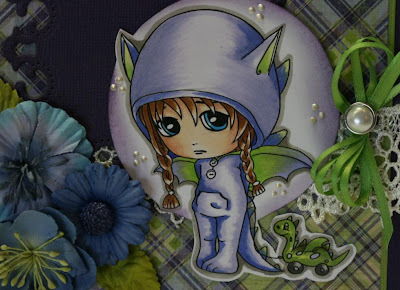 This little image is from a new designer at Whimsy Stamps. 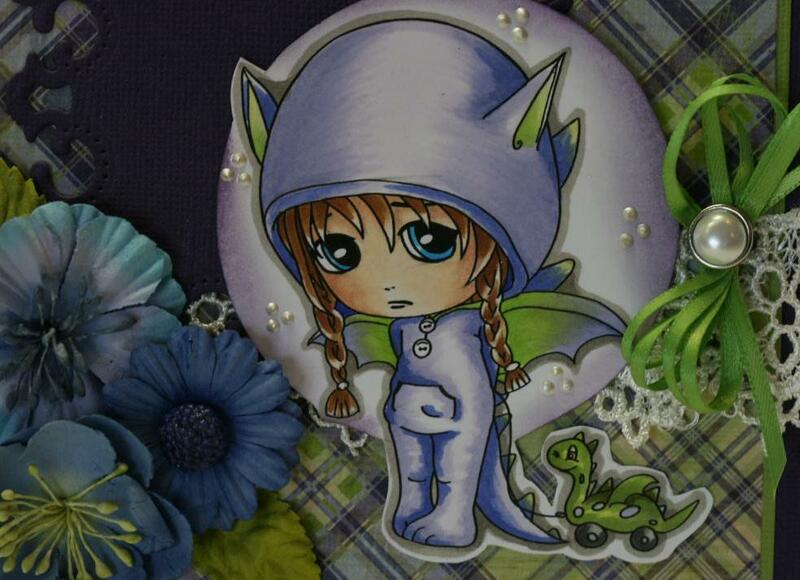 The image is called Baby Boo Dragon Long Hair from Scrapper's Delights Paper Crafts. Isn't the she cute. I loved coloring and putting together this card. The colors purple and green work really well with the color that I used on the image. This card also came together very easy. Sometimes you struggle and just know that your project is missing something and other times it fits together beautifully. Well this one was great to work on. I hope that you get inspired today to create something wonderful. I know that I will. Supplies: Copic Markers, Bazzill cardstock, Fancy Pants patterned paper, Ornate Squares Spellbinder, American Crafts Pearl Brads, Recollections flowers, Prima Marketing rose leaves, Offray ribbon, miscellaneous lace, Ranger distress ink. Have a simply wonderful day. This is so pretty Charlene, such a cute image and beautiful colouring.Love the flowers and design...fabulous card. This card is ADORABLE! I love the stamp and the colours are perfect! Great job! I wandered over from MIM to get a closer look. TFS! nicely done friend, the flowers and paper match awesome...wahoo...way to go! Very Cute! I spotted this sweet card of yours on MIM. I think it has such a fabulous layout, and the blue and green color scheme is beautiful! You've done a great job coloring and cutting the image, and the flowers are beautifully arranged! This is so cute and very gorgeous. 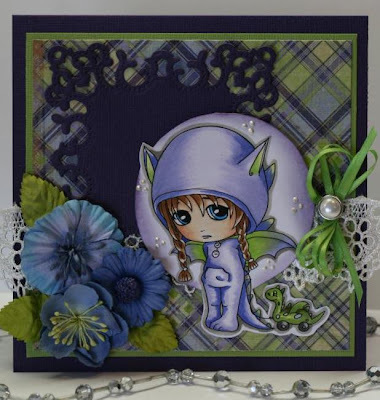 Love the cute image and your colours, along with the lovely layout make it an ace card. I spotted you over on Make it Monday and I popped over for a closer look and I am glad that I did.